Training focuses on the prevention, diagnosis, and treatment of speech, language, hearing and balance disorders in both children and adults. Audiology and Speech-Language Sciences offers programs in speech-language pathology and audiology, each with a clinical orientation. Both graduate programs are accredited by the Colorado Department of Education (CDE) and by the Council on Academic Accreditation (CAA) in Audiology and Speech-Language Pathology of the American Speech-Language-Hearing Association (ASHA). As part of the training program, the department also houses the Speech-Language Pathology and Audiology Clinic, which provides a variety of diagnostic and rehabilitative services to individuals of any age with speech, language, and/or hearing difficulties. The undergraduate program offers a pre-professional bachelor’s degree in speech-language pathology and audiology. At the graduate level, both the speech and audiology programs are designed to prepare students to become professional practitioners in their field. Training focuses on the prevention, diagnosis and treatment of speech, language, hearing and balance disorders in both children and adults. University of Northern Colorado Professor Deanna Meinke has been invited to speak for a second time this year at World Health Organization Headquarters in Geneva, Switzerland. Meinke will present Oct. 1-2 during the WHO-ITU (International Telecommunication Union) Joint Stakeholders' Consultation. 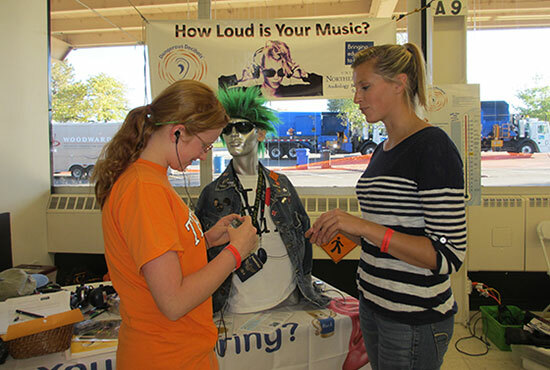 Participants will explore initiatives to reduce exposure to unsafe sound levels during recreational listening and raise awareness of safe listening practices among manufacturers of personal audio devices.